Coca Cola Evergreen Neon Clock. A chrome finished multi tiered rim houses one beautiful real green neon tube that accentuates a Coca Cola design. Please note that the only neon on the clock is the green ring. Comes Ready to Hang in your Gameroom or office. The clock plugs into a standard 120V AC wall outlet and the clock operates off of a single AA battery. The dimensions for the piece are 15" W x 3" D. This is a 100% licensed Coke collectable not some cheap knock off. We have been in the neon business over 23 years. 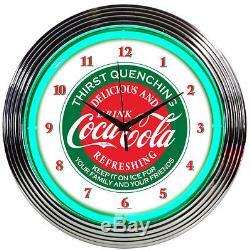 The item "Classic Coca Cola Evergreen neon clock sign Coke Soda licensed green Lamp" is in sale since Saturday, October 06, 2012. This item is in the category "Collectibles\Lamps, Lighting\Neon".